I bought this amp and am very satisfied. Before I go on, I have to say this is for an old SUV I have converted for riding dirt roads and off roading. It is a $1000 truck, so Kicker or JL Audio would be a bit much. I have two Boss 10's in the truck with a few other speakers that are on separate amps. Basically, this amp is dedicated to the 10's only. So far, so good. Now, if you want am extreme boom that shakes the bumper, I would go with a bigger amp. Honestly, this is probably a better amp for one speaker (a 10 or 12) or a set of 8's. Still, it does give decent power and the price can't be beat for this size of amp. One thing I can say is the amp is clear. There is no road noise or humming. If you need power for a small set up, this is definitely the way to go. The only reason I didn't rate this amp higher is because it isn't in the class with your bigger names. Still, for what it is, it I would give it a five in the budget amp category, if it existed. I had considered using this BOSS amp because it seemed to carry the power I needed at a very attractive price. However, after receiving the amp, I learned that BOSS lies about their ratings and performance (like many cheap brands do) and this amp would not power the Alpine SWS-10D2 sub I had bought for it. It says 500W RMS but the real world output is somewhere under 200W RMS because the innards are so cheap and inefficient there is considerable power loss. I verified this with a local pro audio tech, who showed me a test they had done on a more expensive, “higher end” amp from BOSS that was rated for 800W RMS @ 2 ohms and was outputting roughly 212W RMS @ 2 ohms. This is a brand-wide issue. I decided against buying this amp and sent it back and returned the inexpensive audio cables I had purchased as well. This amp would be OK if it were paired with a smaller, low output subwoofer - something that tops out at 200W RMS and maybe has a 400W peak. The amp works and it can serve ok in a simpler, modest-powered audio setup but it is not for anything mid-range or beyond. I went with a Pioneer GM-8601 instead which is much more stable and was only $70 more and had 1, 2, and 4 ohm capabilities, so it’s more adaptive if I change my setup in my car in the future. Don’t buy BOSS unless you’re going to keep things simple. 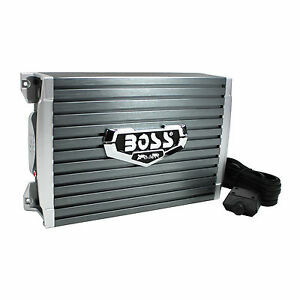 AKA: BOSS amps are for systems only pushing 300-400 total Watts RMS, and you may need the higher rated output amps to power your system and lower power needs. Bottom line: don’t starve your system of power. If you can’t spend at least $100 on an amp you shouldn’t be doing a car audio install.